The 1950s was a magical time in boxing history, in large part because of the rise of television. At the conclusion of 1952 approximately 19 million homes had a TV set, and by the end of the decade, that number had ballooned to more than 46 million. This corresponded with a rise in the number of televised prizefights, as fans were afforded more opportunities to see the biggest stars of the sport do battle. These were very exciting times to be a fan of the sweet science. The 1950s was also blessed with some exceptional boxing talent, including but not limited to well known champions like heavyweight champion Rocky Marciano, welterweight and middleweight champion Sugar Ray Robinson, light heavyweight champion Archie Moore, and another heavyweight champion, Ezzard Charles. In addition to the star power from the time, and the elite level boxing skills attributed to the aforementioned, there were many sensational match-ups, many of which fans can still enjoy the luxury of watching today. 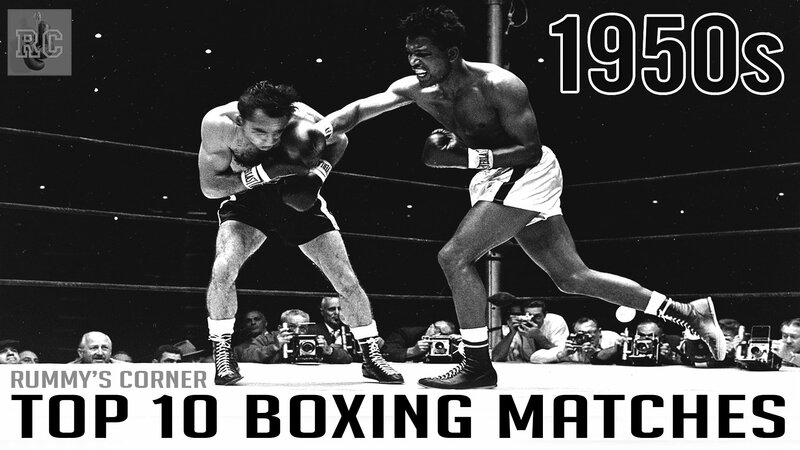 What were the top 10 greatest boxing matches from the 1950s? That’s a tough question to answer, as personal preference factors in, as do limitations on boxing contests that still exist on film. Indeed, if you ask 100 die-hard fans what the 10 best bouts were from that period, it might be difficult to get any two people to agree entirely. It’s quite the daunting task to come up with a definitive answer to the question, and this is a topic that would surely inspire much debate. This edition of Rummy’s Corner attempts to answer that question by providing one man’s take on that question. This installment of Rummy’s Corner is a top 10 countdown of the best boxing matches from the 1950s, that will include highlights and unique commentary recapping the ten fights included herein. For one man’s take on the top 10 greatest boxing matches from the 1950s, please watch and enjoy the video! Next boxing news: Which is the bigger fight: Golovkin v Canelo II or Wilder v Joshua?